The Treasury Department announced yesterday that it will be auctioning off $65 billion in 4-week bills this week (today).  The results showed that dealers submitted $152 billion in bids, with $38 billion being accepted. 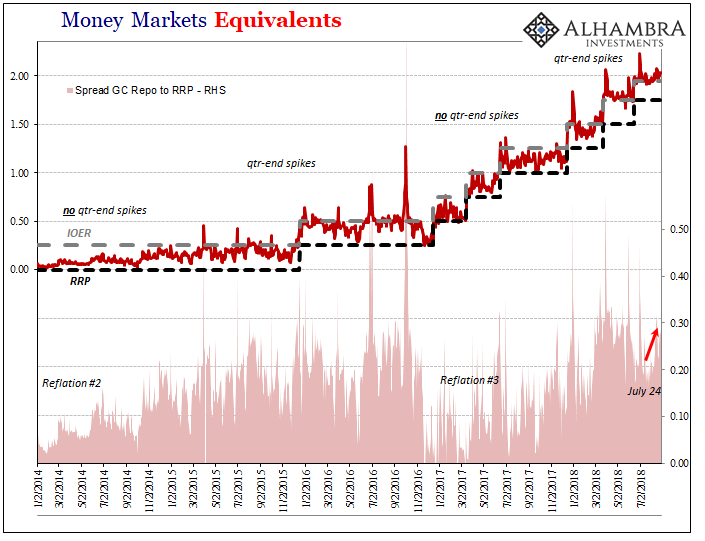 This is supposed to represent a substantial money market hardship according to the mainstream theory established earlier this year. 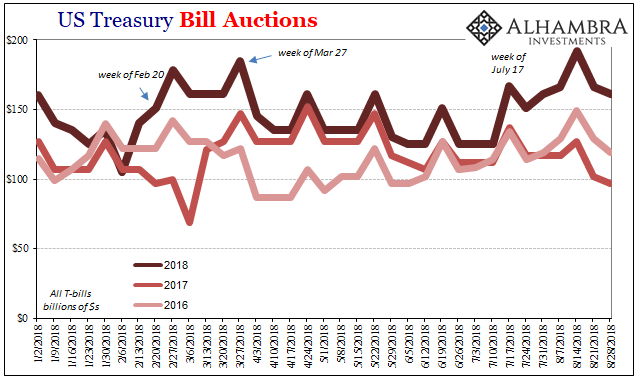 Since mid-July, the government has unleashed another T-bill deluge, most of which has fallen to the 4-week instrument. To give you a sense of the difference, for the auction that took place on July 10, a mere seven weeks ago, Treasury offered only $35 billion. Dealers submitted $92 billion worth of tenders, and won on $20 billion. If you recall the earlier explanation (lie), officials contended that this greater burden for dealer financing this swelling bill inventory meant stress in the repo market. Sure enough, since August 9, the GC rate for UST collateral is up again. It’s not yet nearly as far above RRP or EFF as it was before, but the rate is moving in that direction. From there we are supposed to accept the pull of repo rates on EFF even though that is entirely backward. Setting aside first anything about T-bills and deficits, everyone just breezes past that major upset. This is not how it is supposed to work – unsecured rates are not supposed to be at best steady below those of secured arrangements (how can it cost you so much more to borrow with security than without?) 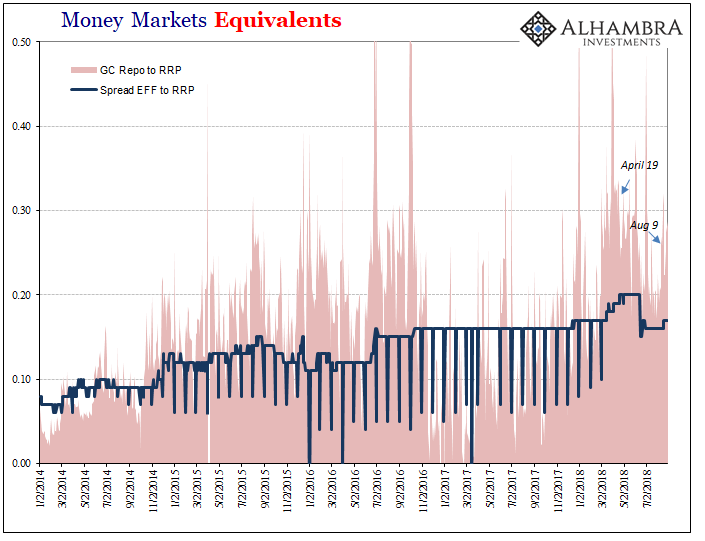 It’s a sign of the times and everything that is wrong with the monetary system that central bankers will only ignore for as long as they have handy scapegoats. For one thing, the Treasury Department’s bill mania has had nothing whatsoever to do with past anomalies. 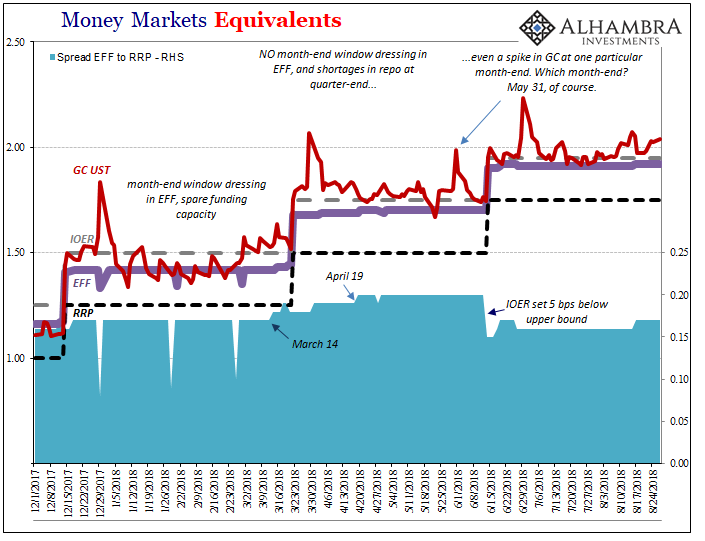 Repo rates tend to get very noisy around quarter ends, but only those quarters which exhibit outside monetary irregularities (deflationary characteristics). Those quarters in which reflation is the dominant trend demonstrate no such tendencies. It’s actually the opposite in federal funds. Up to February 2018, EFF would see month-end dumping as had become standard practice. Following the global liquidations in January and February, however, no longer. It’s as if dealers don’t have any spare capacity they wish to dump, or are able to, in federal funds. But that’s just the first T-bill deluge, right? No. Everything that has been “interesting” about the eurodollar system this year has taken place between March and July. There was the big inflection in the dollar exchange, the re-rising dollar, that began around April 19. Next came the worldwide collateral call on May 29 that may have been the biggest we’ve seen since the autumn of 2008. The eurodollar futures curve in the 2-year window was squeezed following that and finally inverted on June 13. These all took place when the T-bill deluge was on a break, issuance on comparable terms at all tenors to the auctions of the past few years. It’s impossible to argue this alternate reality even in repo. Not only has there been quarter-end rate spikes of late, there was even a highly unusual month-end one. Which particular month-end? The one two days after May 29 and two weeks before the Federal Reserve would adjust IOER for reasons it will refuse to admit. 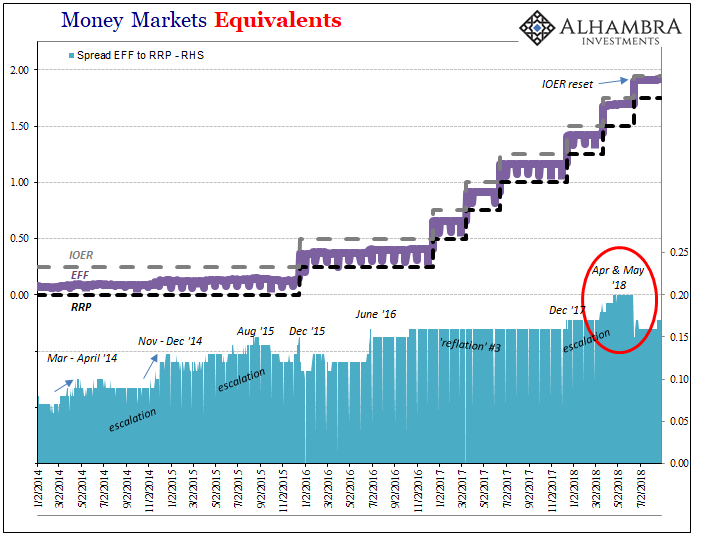 Instead, the jump in repo rates way above both RRP and EFF are further evidence of everything that is wrong when everything gets to be wrong. In an ordered money system, this would never, ever happen. 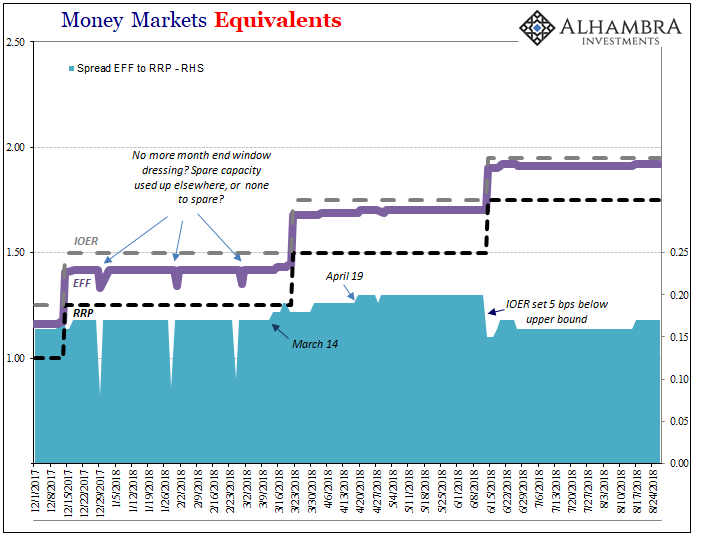 Hierarchy would demand the repo rate fall some spread below both RRP and EFF. They would never flip as they do during these deflationary episodes because there were dealers to police these markets and spreads, creating the sense of a seamlessly integrated dollar system. It was the dealers who provided the resources required for everything to keep to schedule and maintain predictable order. It isn’t coincident that both financial and economic function take hits when disorder of this kind arises. 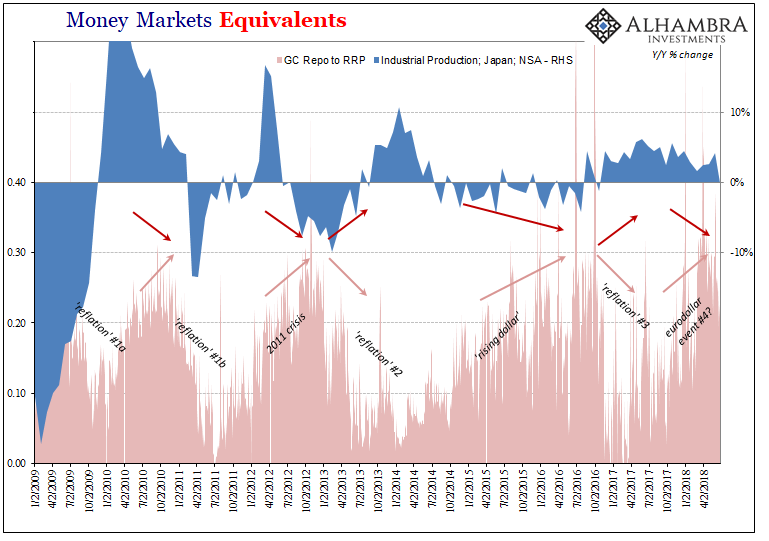 The conspicuous absence of dealers to maintain hierarchy during these specific periods points to the main monetary deficiency – balance sheet capacity. Are dealers struggling to digest T-bills in 2018? If so, what happened in 2014-16? Sure wasn’t budget deficits weighing on the system back then. How about 2011? Or 2010? What was it that embarrassed IOER in 2008 in full-blown EFF rebellion? The opposite of hierarchy is chaos, the best description of each of these eurodollar cases. The common thread each time is the absence of dealers, therefore the lack of hierarchy that results due to a shortage of balance sheet capacity. Dealers get scared by reality and the one thing they know all-too-well is that they cannot count on any central bank for help. Central bankers are too busy chasing unicorn-ed scapegoats.